Using a removable wallpaper can make a glam new look of a room. You may consider to get a new drawer knobs and a good design tap which can beautified your builder grade vanity. If you are renter, it is advisable to choose the removable tiles as it easily to take off by using heat from a hair dryer or whatever. Besides, 2 contrasting style of peel and stick flooring is also a best idea to create one-of-a kind look. If your bathroom had a flat unframed mirror, you can decorate the mirror by adding the peel and stick frame. The removable frame isn’t expensive stuff, so you can choose the design that you prefer to refresh your bathroom with a better look. Even a small area can make your bathroom look more beauty. There is a variety of flush levers on the market today, so discover a stylish one that match the style of your bathroom. Alternately, you can DIY a unique lever for yourself by paint it in different colors an patterns. Replace the modern LED with existing old lighting. It is not only can give your bathroom a stylish look, but also the warm glow it emits will make your reflection prettier. Water pipe is always ruin a bathroom look. If you live in an old building, the more chances that the old style water pipe appear in your bathroom. So, what you gonna do? Well, we share you an idea that you can just buy a thin rope or string to wrapping on it. Simple right? If your shower floor has yellow and black color stains, hide it with teak wooden bath mat and it is naturally waterproof. You can buy one on the market and cut it to fit into your shower floor. 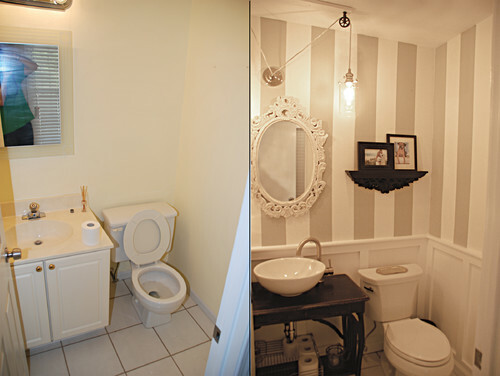 Isn’t it had upgrade the look of your bathroom? Do note that you still need to clean the shower floor and teak mat. We all know that a good-looking shower curtain can brighten insipid bathroom. Besides, it can use to hide an old shower stall as well. By installing the shower curtain, you just need to prepare a tension shower curtain rod which no need screws to install.